The InFusion Controller II in the DIN format offers a wide variety of benefits, with increased processor speed, RAM, and flash memory. 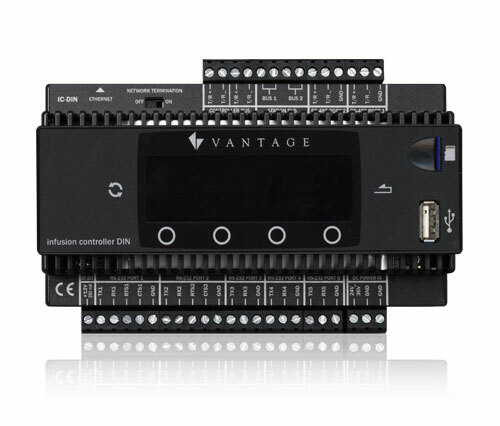 This controller meets the demand for delay-free control of large, complex systems. One InFusion Controller can support up to 120 WireLink stations and up to 120 RadioLink stations. Controllers can easily network to expand the system to 31 controllers. Five RS-232 and two RS-485 ports provide easy device connectivity while an Ethernet connection supports IP connected products. With Equinox, commercial and residential applications will have a variety of controlled subsystems, including lighting, audio/video, security, climate control, etc. The InFusion Controller provides seamless integration of those subsystems—enhancing the entire control experience. See system compatibility notes for legacy controller compatibility.